In the Media - Star Walking Inc. In Issue 96 of THE FORCE we featured a story "Star Wars, through a child's eyes". This was inspired by a story our Editor's boss (in the non Star Wars world) who told us about his seven year old son Bailey seeing the Star Wars movies for the first time. After giving him a contributor's copy of the newsletter, he printed it out, bound it and took it home to show Bailey. Here is the video of Bailey seeing the article for the very first time (remember he doesn't know it's there). 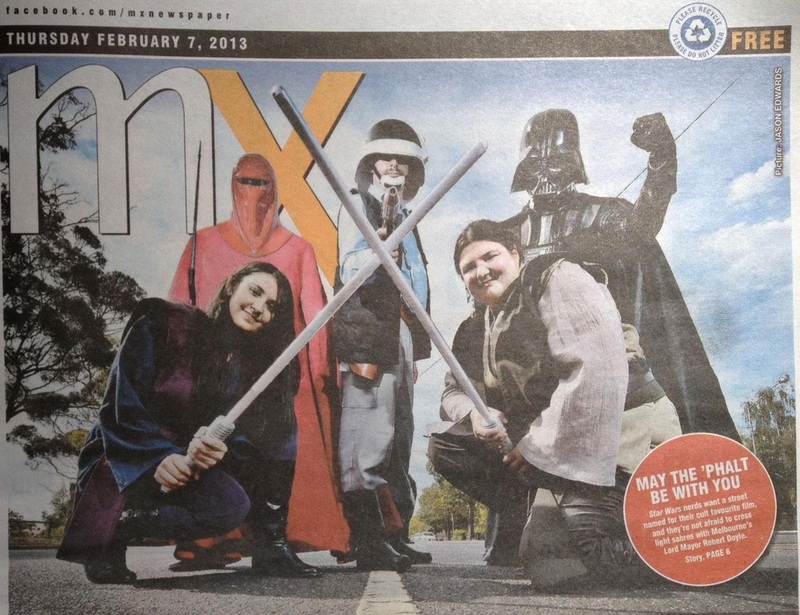 ​"Star Wars St" for the day...while we weren't successful at least Star Walking Inc & Rebel Legion members got some great pictures in Melbourne MX Newspaper. This Documentary was shot in 1999 just before the release of Star Wars "The Phantom Menace" and it follow Star Walking members as the get ready for what they hope is going to be the biggest movie release of their lives...little did they know! Star Walking members in Sydney as they prepare to watch Episode 3 "Revenge of the Sith! Filmed in Sydney around the time Episode 3 was released, this commercial features Star Walking Director (Chris Brennan) as Darth Vader, and other Star Walking and 501st members as the Stormtroopers. ​The Price is Right with Larry Emder! That team of "Hard Hitting" journalists for "A Current Affair" dropped in to film the fans at one of the Star Walking social gathers in Sydney (SKYFORCE). Of course being the respectable people that they are, we thought they'd take our passion seriously and do a great job of showing what a passionate bunch of fans we have. You judge for yourself how they did!